UK readers may want to check out the forthcoming (Dec 31st to Jan 6th) issue of the listings magazine The Radio Times. 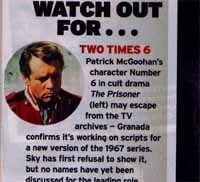 The issue features a 12-line article on the planned re-make of "The Prisoner" series (a basic resume of the information found further down this news page), complete with an image of Patrick McGoohan dressed as one of the Napoleons in the episode "The Girl Who Was Death". "TV and Satellite Week" also covered the story during December - their article, similar to the one in RT, can be seen HERE. Thanks to Roger Goodman and Funkyjudge for this news item.